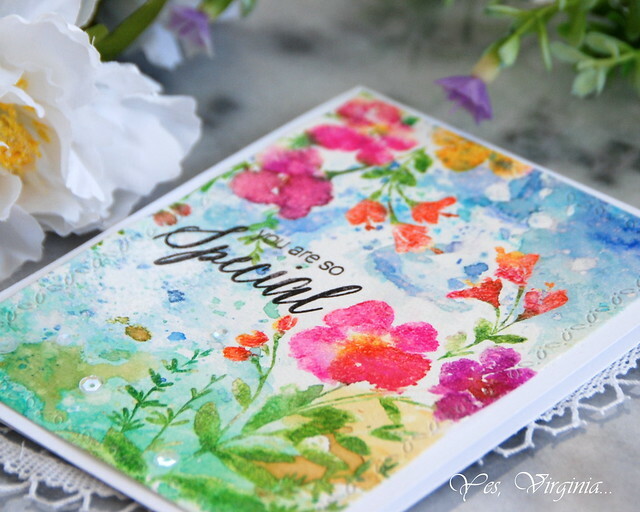 Spring is definitely in the air and I feel like sharing a Spring-y kind of card! Today's card is a clean and simple one with lots of colors and details. Use code RANGER20 to save 20% off Ranger brand products. 😉——-> Blossom Branch is back in stock! 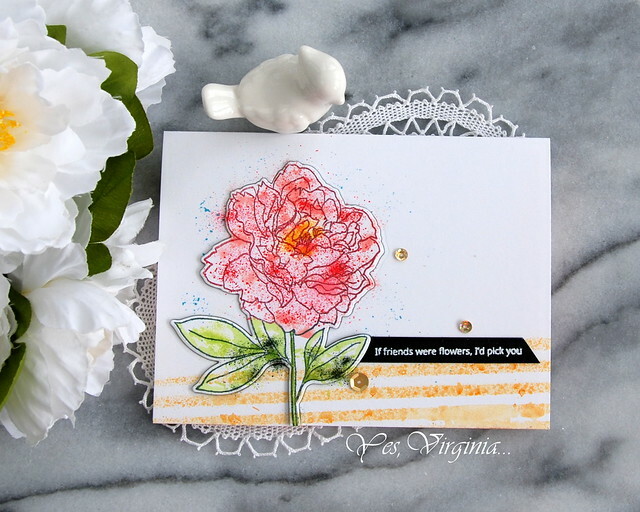 For this card, I relied heavily on tools like MISTI to add colors and layers. 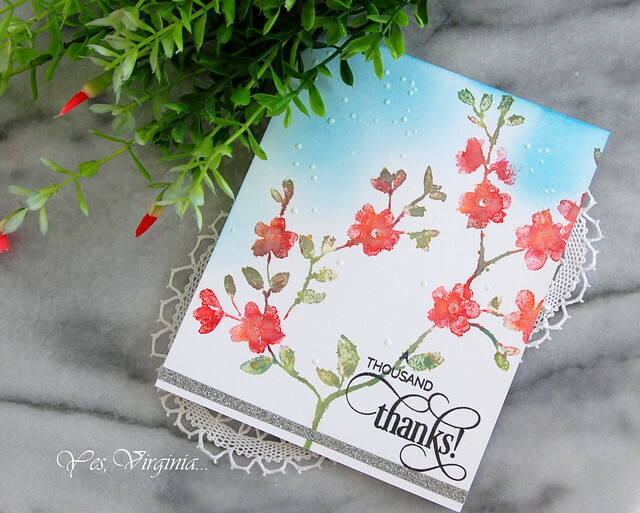 This stamp Blissful Blossoms has lovely image and details. If you like cling stamps like I do, this one is really awesome to have! What do I love about cling stamps? I find that they absorb ink really well, especially inks like Distress Ink and Distress Oxide. 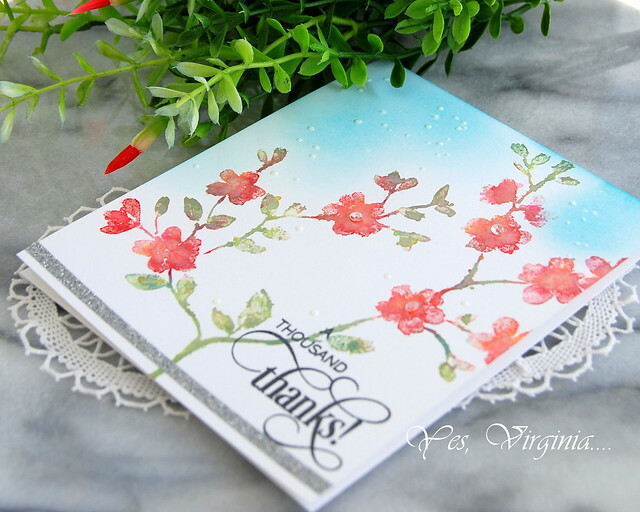 I also love the ease of misting water after I ink up the cling stamps. I sometimes use watercolor paper for this purpose. 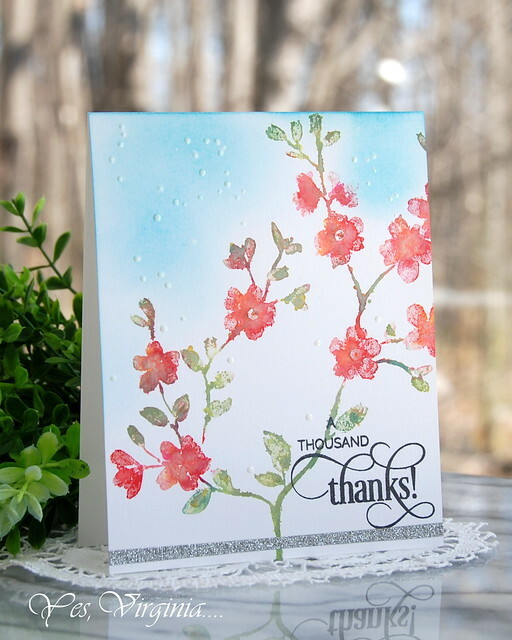 However, regular heavy card stock will work just fine as long as you don't add too much water at one time. That's something I find cling stamps are at their best. 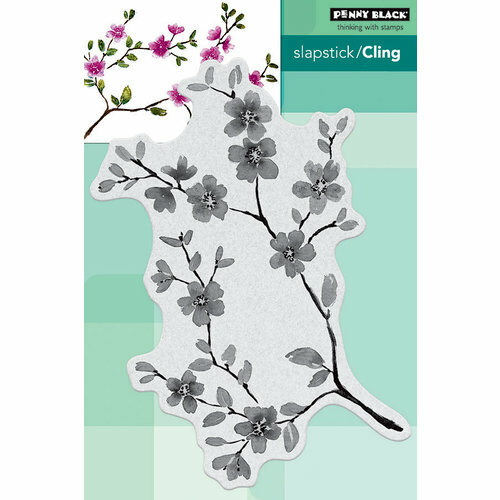 Cling stamps also have deep etched details that they stamp better than the regular polymer clear stamps, in my view. 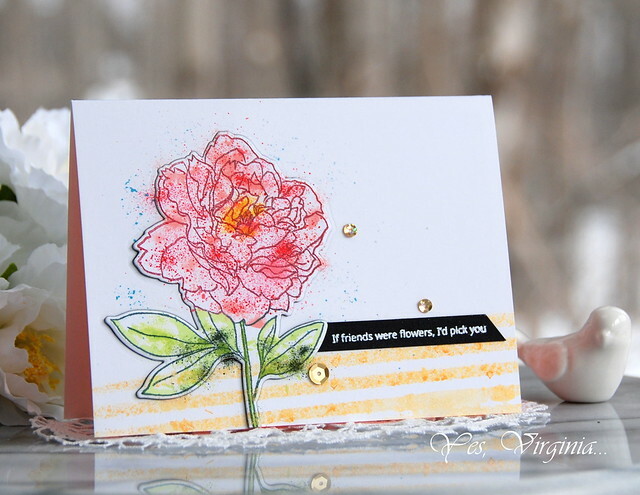 For example, in each petal and leaf, I used 2-3 colors of ink to create the various hues and shades. It is also important to have white space....to keep the entire design in good balance. 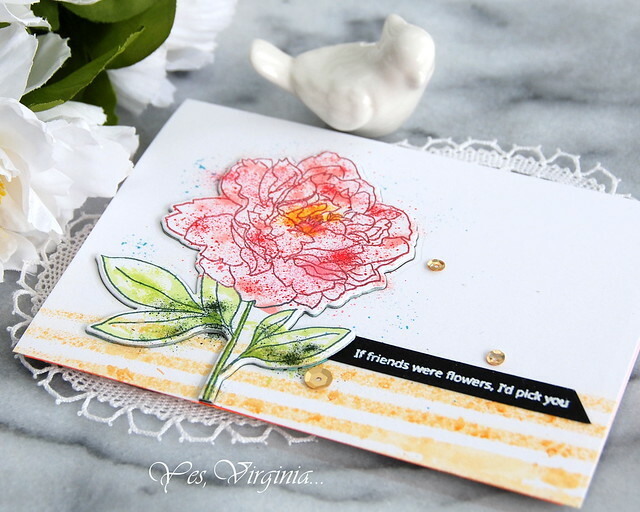 I hope this post inspires you to look at cling stamps in more creative ways. 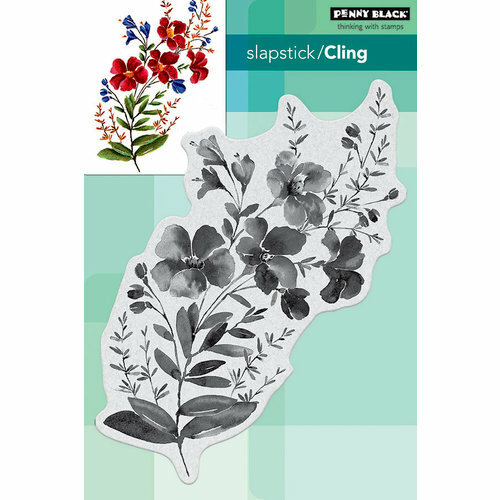 I am listing a few more cling stamps from Penny Black and I will be sharing more projects about these cling stamps soon again. This die set may look complex and difficult to assemble. However, the dies are pretty simple to use. The easiest way to assemble the roses is to group the layers according to the size. 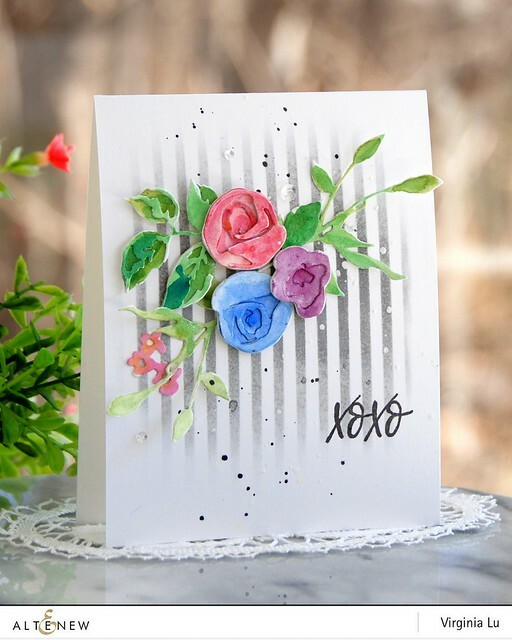 Once I adhered the various layers for each individual roses, I applied Altenew ink with water. Basically I made my own water color palette with the Altenew inks. 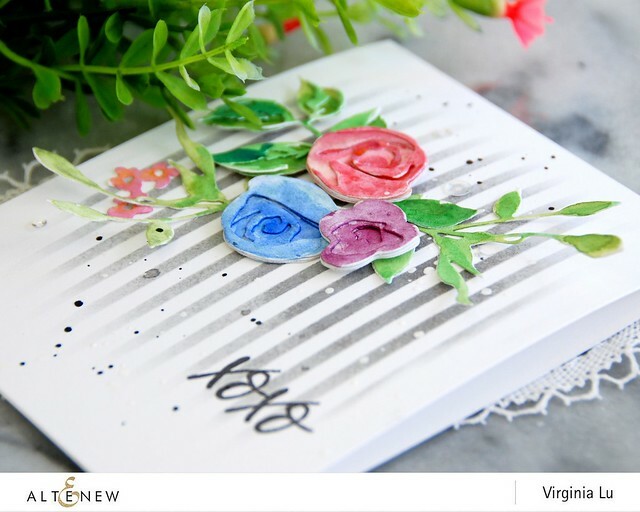 I wanted to create a simple yet interesting background for the water-colored roses. I took out the Classy Stripe Stencil as it seemed to be perfect for this purpose. I started from the upper middle point and then gradually inked toward to top and bottom. I love the splatter from the three new spray colors--silver, pure white and Jet Black. and it is now perfect. 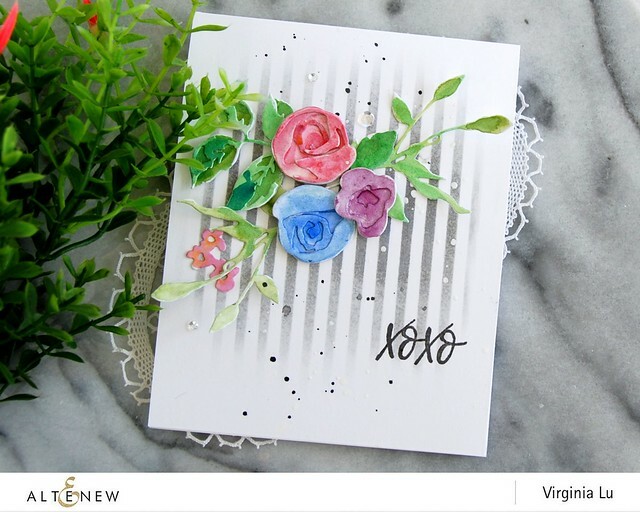 I would love it if you can stop by Altenew Card Blog and leave me some love! Much appreciated! Sometimes the die is so large in scale, it can be a little bit intimidating for a card maker! 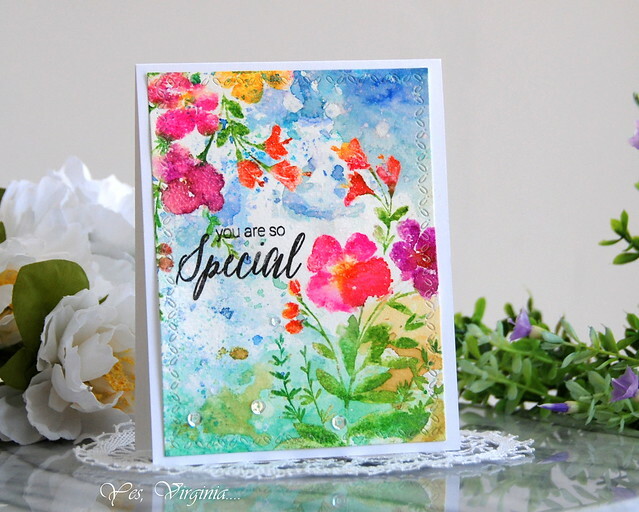 I have seen some gorgeous examples with this die during the Altenew March Release Blog Hop. I decided to use it in a different way. 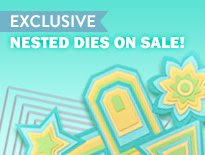 That is, use the die for dry-embossed background. 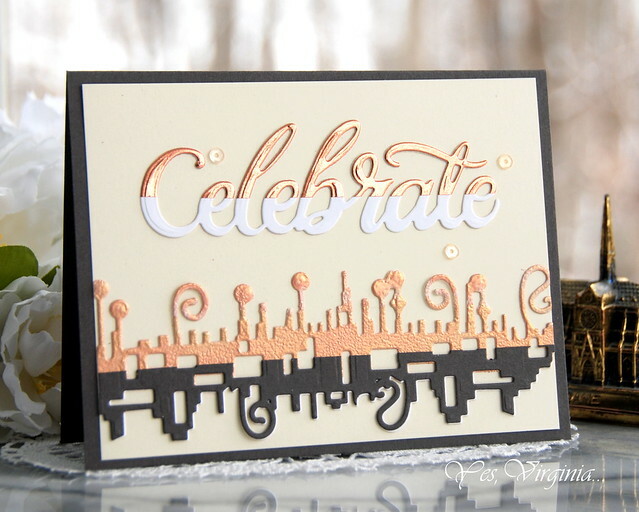 Basically, you sandwich it with the cutting plate and The Spellbinder Tan Embossing Mat. Honestly, I think it will be great to use this die as a doily and call it a day! If you have a fancy tea/dinner party, consider using it as part of your pastry decorations! 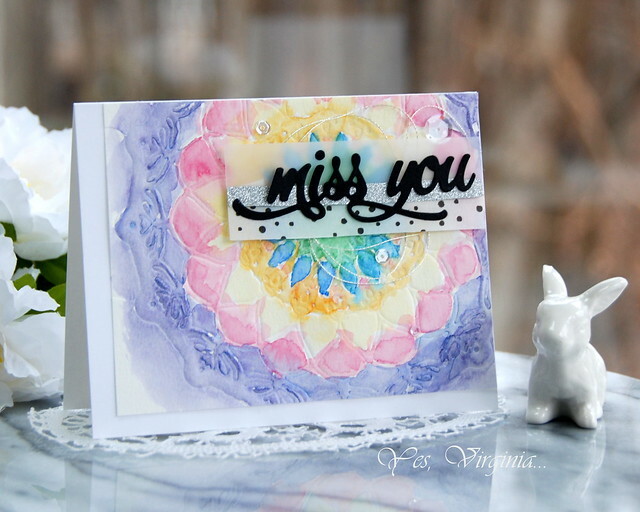 I used Canson Watercolor paper and Mandala Die for the dry-embossing first. I then had lots of fun coloring it with Gansai Tambi (36). However, having fun coloring doesn't always yield to good result ( haha). For the sentiment, I used three different element: glitter Tape, Washi Tape and vellum. Overall, I think I am happy with the result. 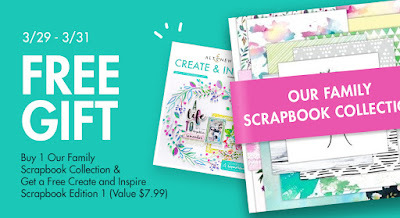 Receive a FREE Create and Inspire Scrapbook Edition 1(value $7.99) with every order of the Our Family Scrapbook Collection . 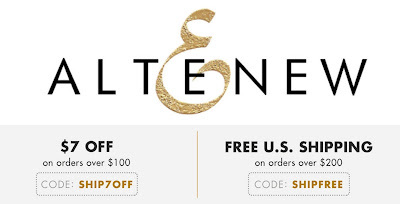 3 Day only! It will be added to cart automatically. While supplies last. Limit one per customer. Not valid on previous orders. 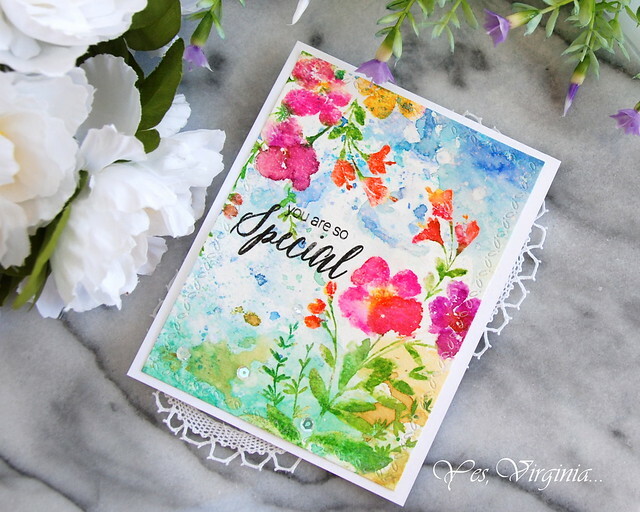 as I have a super bright card for you. I am linking this to Scrapbook. com as it is out of stock over Simon Says Stamp. Here is my previous post with this very same stamp. Very different from today's card, huh? Today's card is my 2nd version with same approach but with different media. I used my Zig markers for this purpose and applied one little bit of coloring at a time. 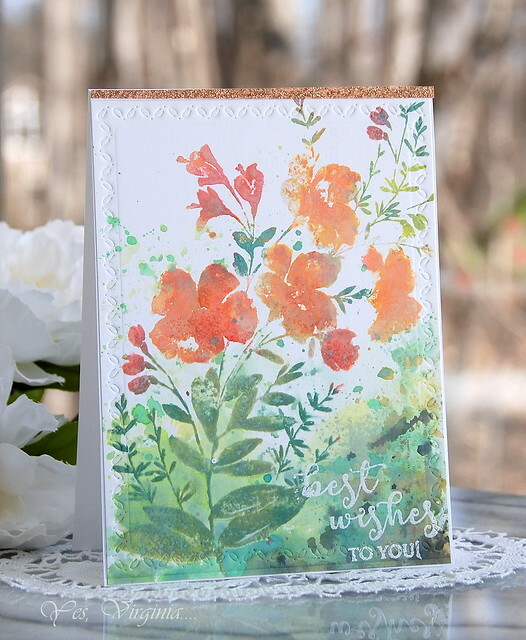 A MUST for stamping a card like this: heavy watercolor card stock, MISTI and (any) watercolor medium. You also need to be patient to add layer and layer of colors and allow it to dry from time to time. I hope that you are inspired! 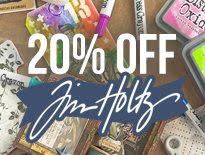 Scrapbook.com also has 20% off all things Tim Holtz (see here). 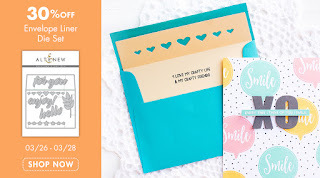 If you do shop over Scrapbook.com, there are FREE TH Distress Crayons giveaway (today only!). ps: I am also listing a few Penny Black stamps that will work with today's techniques and supplies. Jazz Up Those Metal Dies! I want to pop in with a quick post about using metal dies in interesting ways. 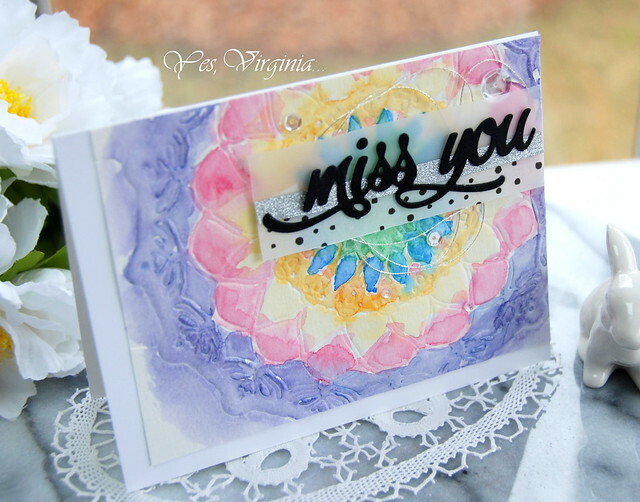 The TWO dies I used in this card are from Spellbinders. For the sentiment die, I applied Rose Gold paper on white card stock. 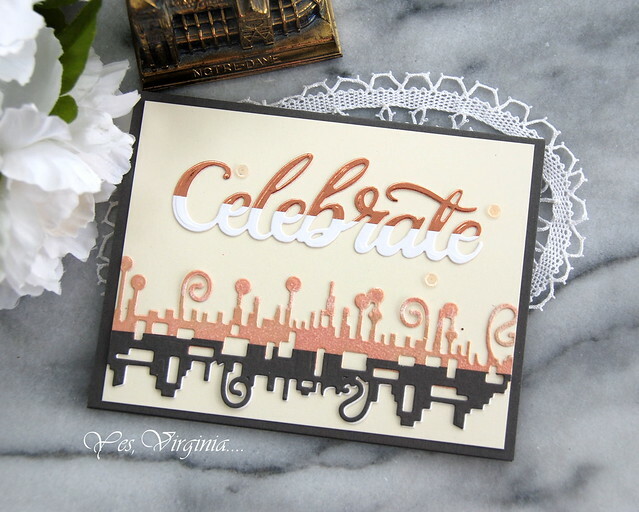 I then lined up the word "Celebrate" in white card stock and rose gold paper. 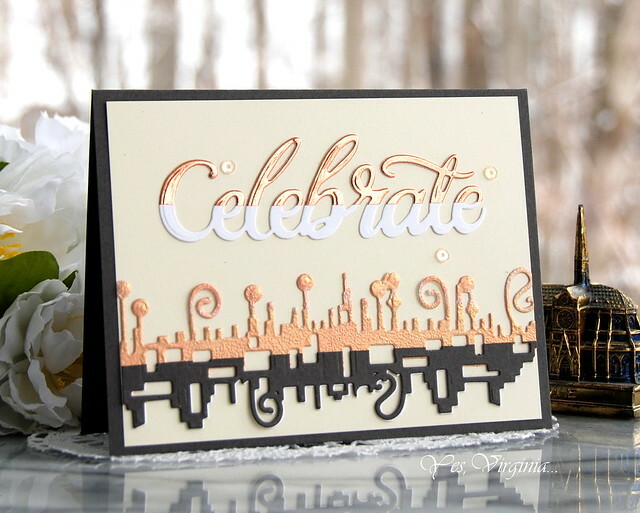 For the border die, I did something similar....I emboss the upper half "Celebrate" in Rose Gold (Altenew) Embossing Powder. Then I die cut a piece of dark grey card stock and ran it thorough the Platinum Die Cut machine. I then trimmed and glued the two pieces together. I love how "dressed-up" the dies look! 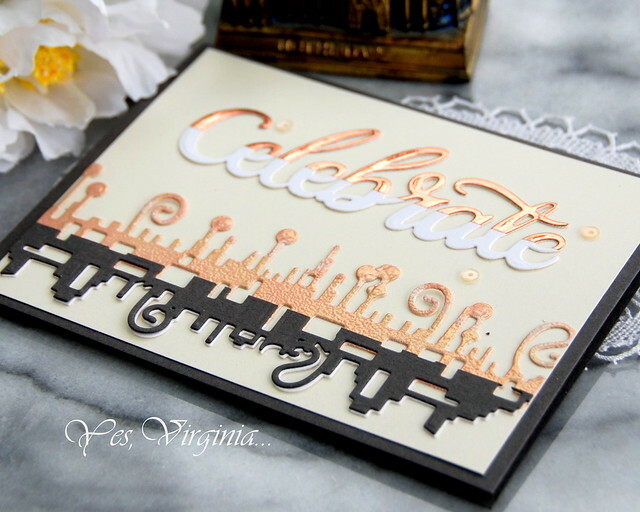 This card is 100% die-cut (no stamping involved)! 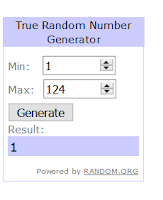 Hope you give this a try if you have not done so. 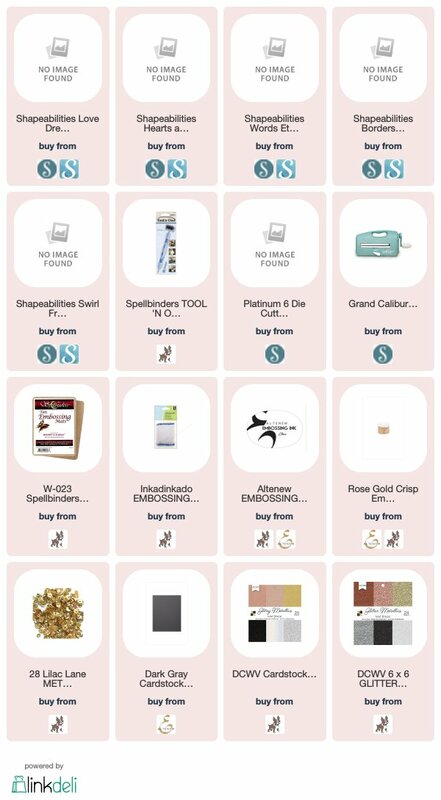 Here are the new arrivals from Spellbinders. 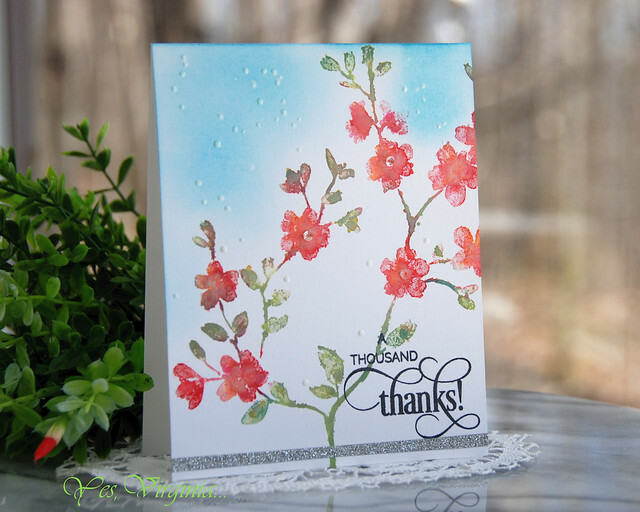 It's time to announce the Altenew March Stamp/Die Release Blog Hop winner. 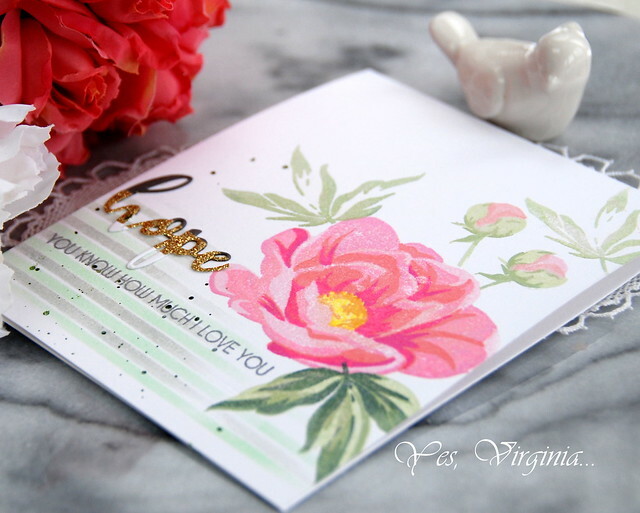 Three super creative cards Virginia! I like the multiple white die cut words in the background of the second one. It's such a cool card! Congratulations, Lisa! 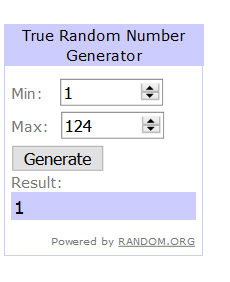 Please e-mail me at becr8ive2@gmail.com to claim your prize! Thank you for your wonderful comments and feedback. I savor and read each and every one! 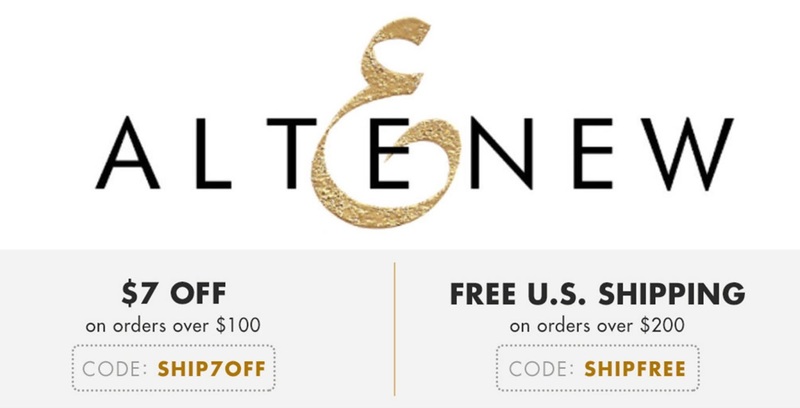 Altenew is having a 30% off on Envelope Liner Die Set! 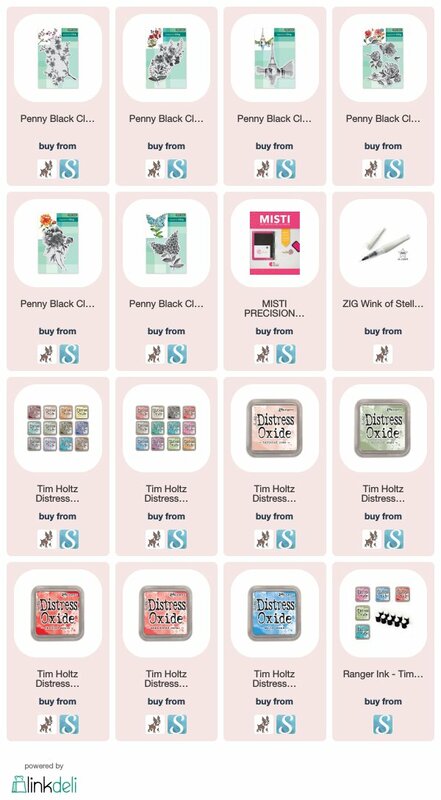 Shop for nesting dies here. If you like butterfly dies, this one is a goodie! Today is my 2nd installment of Stencil Sunday! I know spraying mist to the cards can be intimidating and out of control. However, with the help of stencil, spraying can be orderly and contained. Today's card is pretty organic, yet it is not chaotic or messy. 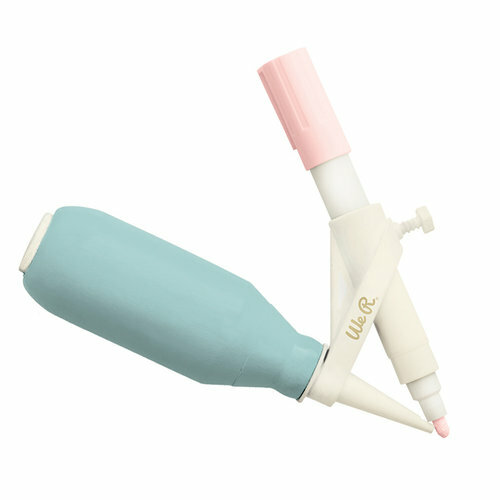 Well, the "secret weapon" to color the image is this simple tool. 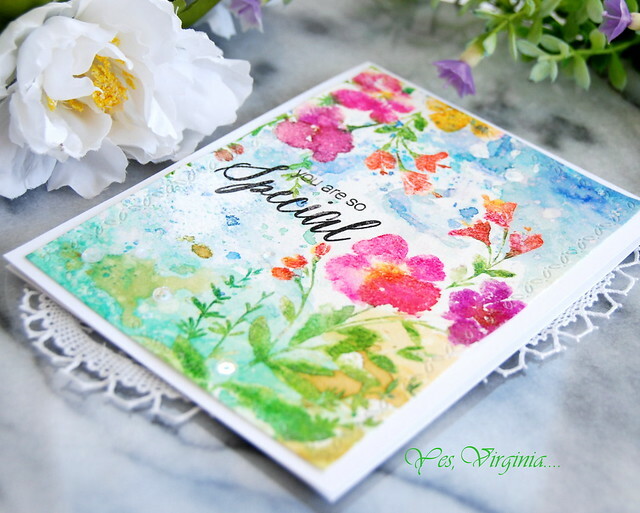 It is awesome for spraying colors to the flower or any element to your cards! I used Altenew Artist Markers for the coloring and I really love the spritz of colors here and there. 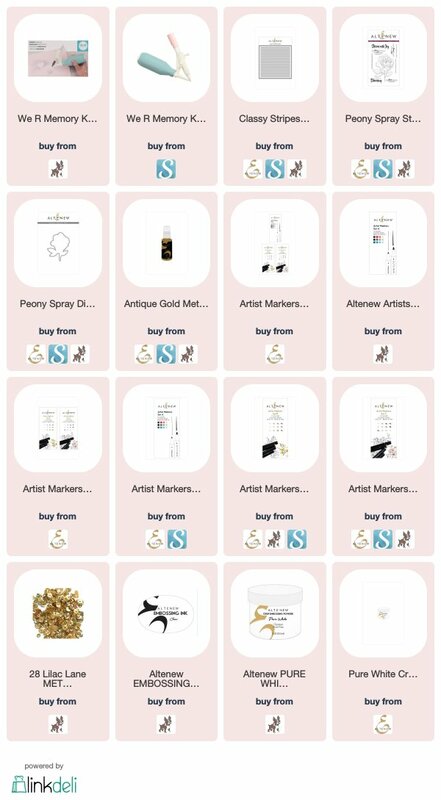 The Classy Stripe Stencil comes in handy for adding the shine with Antique Gold Spray! I must also add that the AirBrush Tool is a pretty cool to play with. It will work with any alcohol markers. I even tried water color markers and Distress Markers and all you need is a spritz of water to the markers and then spray with the tool! 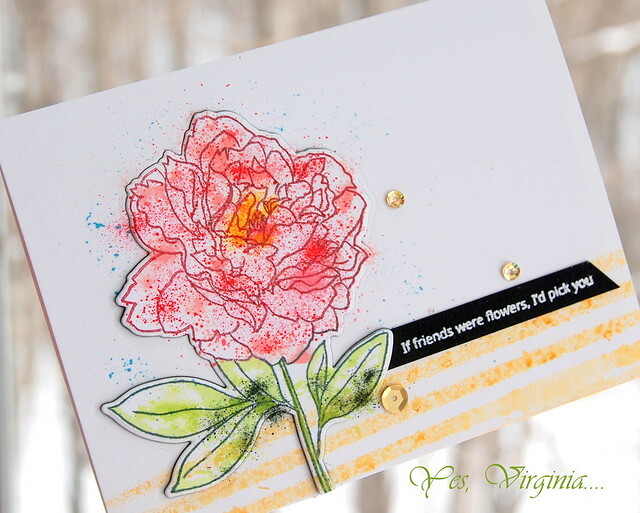 It is a good idea to isolate the flower and the background as I used different colors for each element. It is sort of a "controlled chaos" as you can say. I also die cut a few the Flower dies and stacked them up a bit to make it stand out. The white-embossed sentiment helps to draw the eyes to the focal point. 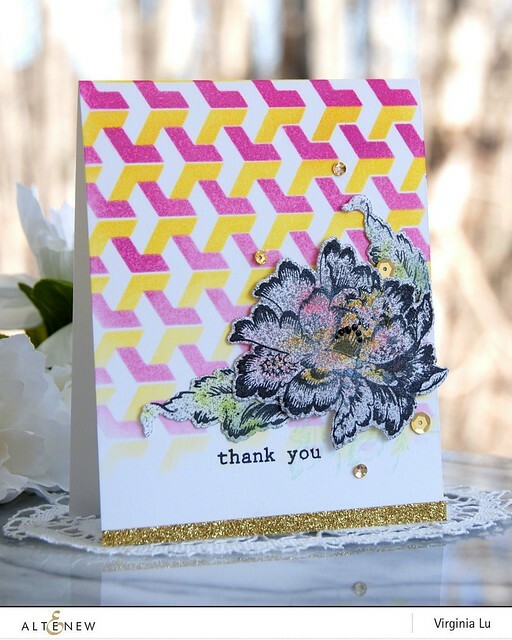 Lastly, here is another idea of using the same Classy Stripes Stencil in case you miss seeing my previous post. As you can see, I used two colors with this stencil. This stencil truly is versatile. I felt that I am only touching the surface (more to come later)! 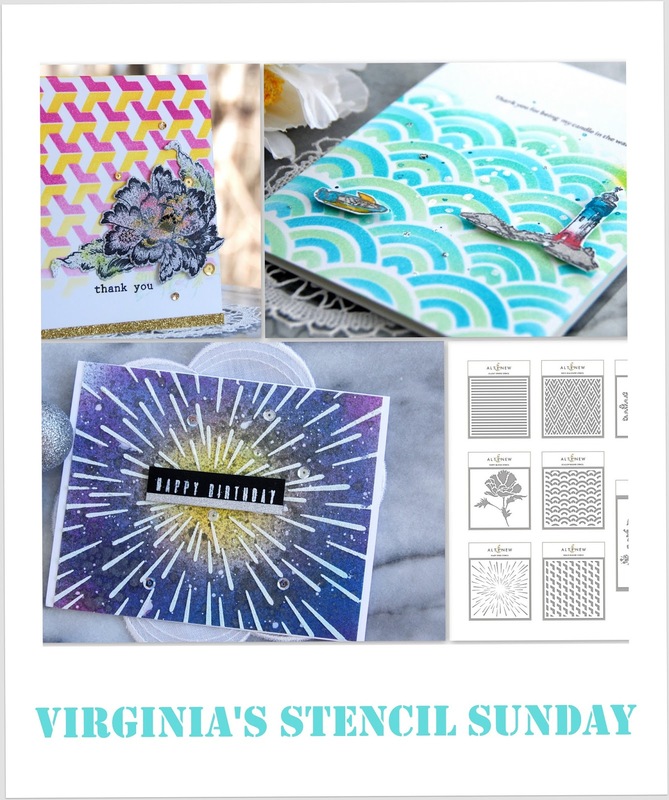 Hope that you are enjoying the Stencil Sunday series and are getting some inspiration. Textures with Pops of Color! 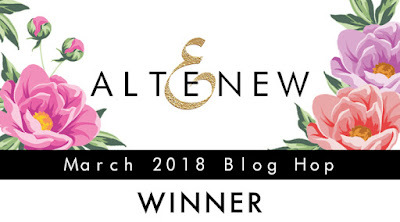 Altenew March 2018 Inspiration Challenge!